At least five people were wrapped up in three separate robberies in Lakeview East early Saturday. Two of the muggings were reported in the heart of Boystown. No one is in custody and only minor injuries were reported, police said. 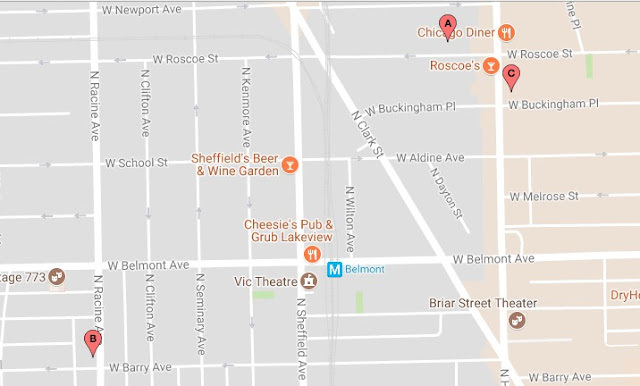 • Around 3:40 a.m., a 36-year-old man was walking with his girlfriend in the 800 block of West Roscoe when four offenders jumped from a car and punched him in the face. The other men took the victim’s property and then returned to the vehicle, which fled westbound on Roscoe. The victim said the offenders were Hispanic men in a green Ford Taurus. • About 30 minutes later, a man and a woman were walking in the 3100 block of North Racine when two men emerged from a corner and demanded their valuables. A fight broke out and one of the offenders kicked the 29-year-old woman in the face. She and the 29-year-old male victim were both treated and released from Illinois Masonic Medical Center, police said. Police said the offenders were two Hispanic men. One is tall with a bigger build. He wore a black jacket. A shorter offender wore an orange coat. They fled southbound in the west alley of Clifton in a Chevy Malibu or Impala. The third victim told police that he was mugged outside of Wood restaurant at Halsted and Buckingham. Please support CWB's newsgathering operation with a donation to our Tip Jar.